Hello 2017! We welcome you and all the plans you have in store for us this new year! Before we officially welcome the New Year, we would like to express our gratitude for all the wonderful and inspiring moments from 2016. The year 2016 blessed us with beautiful clients and so many exciting new design projects. One of our most detailed and rewarding projects was a new home, turn key style, in Orchard Hills. We had so much fun designing this home and filling it with beautiful furnishings, custom draperies and pretty details throughout. The result was an ABSOLUTELY gorgeous home for a family that we adore. 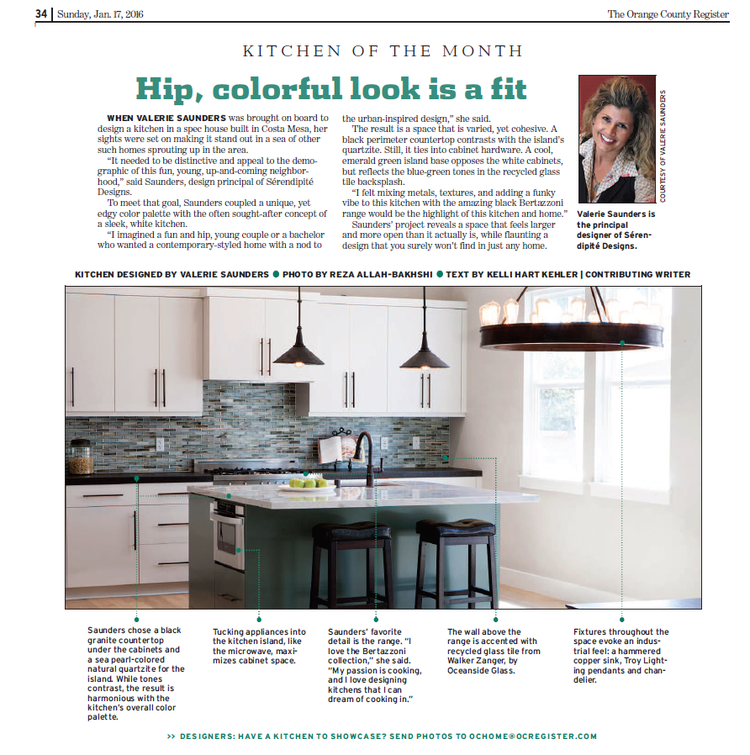 In both January and April, we were featured in The Orange County Registers “Kitchen of the Month” with two of our kitchen designs. This was so exciting and really a huge honor to be featured twice, and the write up we received from Kelli Hart Kehler was so gracious. Thank you OC Home! Another particularly unforgettable time in 2016 was when we participated in the Orange County Philharmonic House of Design at The Strand in Dana Point. We learned so much, made new friends and participated in a lovely foundation that gives back to our local community. We were grateful to be a final nominee for the HGTV contest “Fresh Faces of Design”. What a huge honor to be one of five finalists on a national level. The talent we were up against was incredible and we were delighted to be included with these gifted designers. Above all, we are so thankful for the journey and how loyal and trusting our clients are, without you we would not be living our design dreams and all our creativity would just be a pretty vision somewhere inside our heads. Good bye 2016, you have been beautiful! Happy Designing & Happy New Year!